This guide describes materials available in the University of Iowa Archives, Department of Special Collections, that pertain to student protest movements during the 1960s, 1970s and other periods. RG numbers refer to the described collection’s record group number. If you have questions about our holdings, please feel free to contact us. Alumni: Smith, Donald R.; Smith, Stephen L.; Yeager, Tim. RG 01.0015.001. Buildings and Grounds: Old Armory. RG 01.0015.002. Buildings and Grounds: Old Armory Annex (“Big Pink”). RG 01.0015.002. Buildings and Grounds: Temporary. RG 01.0015.002. Organizations and Clubs: Students for a Democratic Society (2 folders). RG 01.0015.004. Subject: Journalism: Daily Iowan, controversy (L. Durham), 1970-1971. RG 01.0015.005. Subject: Miscellaneous: Student Protest, 1965 to present (8 folders of clippings and other material). RG 01.0015.005. Anti-War Petitions Collection. Campus response to Dow Chemical manufacture of napalm during the war in Vietnam, 1967. 0.25 linear feet. RG 02.0006.002. Center for Draft Information and Counseling. 1.0 linear feet. RG 02.0002.002. Editorial Comments of Iowa Television Stations Collection, 1965-1985. 3.75 linear feet. MsC 0158. FBI files on Iowa Colleges and Universities Obtained Under the Freedom of Information Act by The Des Moines Register, late 1960s and early 1970s. 3.0 linear feet. Six boxes. RG 02.0006.004. New University Conference (a left-of-center faculty and student organization). 7.0 linear feet. RG 03.0009.001. New Wave Party Records, 1980-1992. 10.0 linear feet. RG 02.0006.003. Papers of Emil Rinderspacher, 1967-1977. Co-founder of the Center for Draft Information and Counseling. RG 02.0009.030. Presidential Correspondence collections: Papers of Howard Bowen and Papers of Willard Boyd, 1964-1976. RG 05 series. Records of the Administrative Liaison Group on Student Unrest, 1970-1973. RG 05.0003.014. Records of the Department of Mathematics. Includes one folder on draft deferments for faculty during World War II, correspondence series, 1941-1946. RG 06.0022.001. Records of the Iowa Memorial Union. Includes scrapbooks of clippings pertaining to Soapbox Soundoff, a free speech forum founded in 1964, and a draft card burning incident at that venue the following year. RG 24.0004.001. Records of the Iowa State Board of Regents. RG 04 series. University Relations and Outreach, “Editorial Review; Recent Editorials Relating to the State Board of Regents and/or the Institutions, 1963 1976.” Editorials from Iowa newspapers, including letters to the editor. 0.5 linear feet. Part of RG 23.0005.002. University News Service, Subject Series. RG 23.0005.001. Papers of D.C. Spriestersbach, 1952-2000. RG 99.0255. Papers of Frederick Wezeman, 1947-1973. Includes Iowa City peace vigil, 1966-1973. RG 99.0123. Bourjaily, Vance. Now Playing at Canterbury (1976). Special Collections Iowa Authors; Main. Engel, Robert. “A Description of Events Which Occurred On or About the Pentacrest Area on May 7 and 8, 1970.” In Historical Papers Collection. RG 01.0001.003. —-. “The Herrnstein Affair, 1972.” In Historical Papers Collection. RG 01.0001.003. Felsen, Milt. The Anti-Warrior: A Memoir. Iowa City: University of Iowa Press, 1989. Luck, David J. 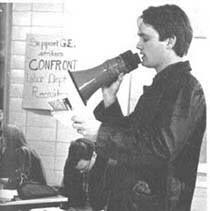 Student Protest at Iowa (1969). A photographic essay. University Archives. Musselman, Gearhart. History of the Iowa Memorial Union (1969). Refers to “Soapbox Soundoff,” a free speech forum established by the IMU in 1964; also the site of an early draft-card burning demonstration, October 1965. University Archives. Potter, H. James, ed. Iowa ’70: Riot, Rhetoric, Responsibility? (1970). University Archives. Shields, David. Heroes: A Novel (1984). Main. The Daily Iowan, 1901 – present; bound volumes in Archives (RG 02.0011.001). Also microfilm in Media Services. Note: Some of the Archives’ volumes are closed for research due to their fragile condition. Back issues of the Daily Iowan and its predecessor publications are available online as part of the Iowa Digital Library. This digital collection, when completed, will span 1868 to 2006. Some University-produced publications include references to student protest activity. Titles of over 200 such publications may be searched in the University Serials and Journals Collection (RG 01.0009.002). The State Historical Society of Iowa in Iowa City has numerous manuscript and photograph collections pertaining to the University of Iowa student unrest period of the 1960’s and 1970’s.